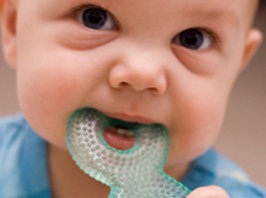 Often one of the first signs of teething is when your baby starts to drool all the time. Since there is nothing you can do to stop drooling, you will want to do what you can to make sure your baby stays dry so as to avoid infection. Each baby drools differently. Some just a little and others enough to fill a jug. Most, though, fall inbetween. You will want to have on hand a stack of cloth bibs to protect the clothing and keep your baby dry. The ones I like best are thick cloth ones that absorb well. You can also get bibs with a plasic lining on the back so that the drool doesn’t soak through to your baby’s clothes. Whichever you choose, you will need to keep an eye on how often the bib gets wet and make sure to change it as soon as it is wet around the neck. Because of the fat rolls a baby has around their neck, it is easy for infection to set in if the creases get wet and dirty and are not cleaned well. You may find, like I did with Lila, that no matter how well you clean those creases, you will still smell a rotten cheese-type odor in part of their neck. I thought I was getting everything clean, but she had so many creases and folds on her neck that it was easy to miss parts. I would wash her and still smell that smell and could not figure out where it was coming from. I finally had to tilt her head to the side and open the folds and I found a part that was infected. To get rid of such infection, the area must be dry. Easier said than done with a drooling baby. Since the infection will most likely be under the chin or on the side of the neck, you will need to tilt your baby’s head to clean it. Wash with water and soap, then dry well. Don’t rub it dry; just daub it gently so as not to hurt your baby. To help it heal, apply an antibiotic powder (I used Neosporin). This will keep the area dry too. Do this as often as needed throughout the day, until it is healed. You may find, as I did, that the same area will be prone to repeat infections, and that it will continue until your baby gets bigger and the folds of fat disappear with growth. In hot weather you may need to clean baby’s neck a few times a day. This is easy to do with a washcloth. – Use bibs when your baby starts drooling to keep their clothes dry. 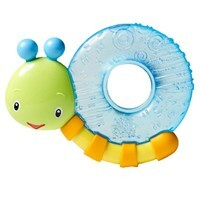 – Change wet bibs as often as needed. – To avoid infection, wash the creases in your baby’s neck well daily, or as often as needed. – If infection sets in, wash and dry the affected area, then apply an antibiotic powder. How have you handled such a situation?